This commercial building had an old, tired and uneven front landing. It was uninviting and really made the building look dated. 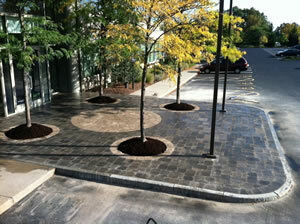 The owners wanted a more beautiful and inviting entrance to their building. The agreed upon plan was to renovate the landing using pavers. 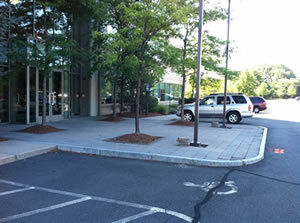 With the owners, we decided to leave the existing granite curbing. They were still in decent shape, and it would also help save some money on the project. One of the biggest problems with the existing landing was the insufficient base. 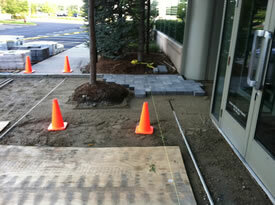 This caused the pavers to rise and sink, causing an unsafe walking surface. We removed the old pavers and excavated the old base, being careful to cause as little damage to the tree roots as possible. After that we installed ¾" processed stone in 3" increments using a vibratory compactor to ensure full compaction in all areas. 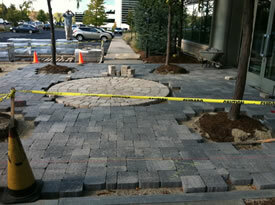 We decided to go with a Charcoal Blend Paver Stone with Amaretto Circle Packs to add a splash of color and contrast. The circle pattern would also tie in the 4 existing locust trees by replacing the square bed borders with Amaretto colored soldier course. After all the pavers were laid, we installed a special polymeric sand that acts to keep the paver joints tight, while also putting a nice finishing touch on the project. What a great way to attract more business by increasing the curb appeal of the building.